The calming ambience of nature and wine make a great combination. On Pentecost Sunday we relive a unique tradition and invite you to the cellars of wine producers with the opportunity of tasting wines of previous vintages. Take a stroll in the valley of Pagan-hill, enjoy the nice weather and the hospitality of local producers in refreshing natural surroundings! Admire the fascinating view from the top of the hill, visit the cellars to taste local wines and get to know more about the production process! But first of all: save the date! 20 MAy, Pentecost Sunday, 10 a.m. – 6 p.m. This year, Day of open cellars will take place in the Kőszeg-foothills region (from Pagan-hill to Cák) on 20 may, 2018. Tickets can be purchased at the entrance of Pagan-valley or at the fire station of Cák. The price of tickets on the spot is 2 700 HUF, but with former online registration it is 2 000 HUF. Send us your registration until 12 May and print the virtual ticket sent in confirmation e-mail that will be exchanged for a ticket with discount at cash-desks. 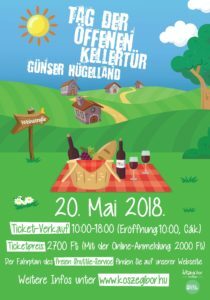 Ticket price includes the free entry to cellars, tasting wines and snacks and the bus shuttle service. At the entrance you can purchase our wine tasting package consisting of an itinerary with map, furthermore the information boards on site will guide you to find the open cellars and their wines. Moreover, each package includes one wine glass and 16 drink tickets (each is valid for 1 dl wine to redeem). Please, support the success of our event by purchasing our tasting package. We would like to make this trip as convenient as possible, so you have the opportunity to use the free bus shuttle service from the railway station of Kőszeg. Travelling up to cellars is not feasible, thus the bus only stops at Cák and the entrance of Pagan-valley. Timetable can be found on the webpage. The location is also accessible by car or bicycle. 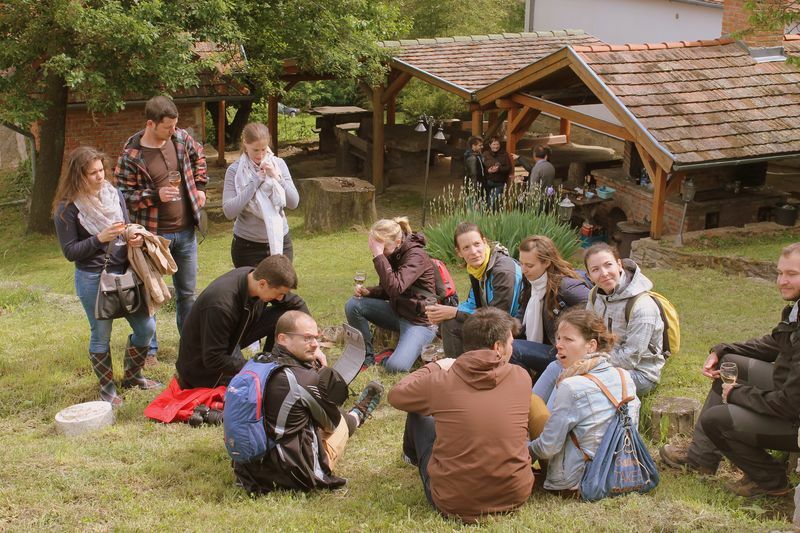 The 4 km long trail is not a hard task to walk along, especially in a great company! 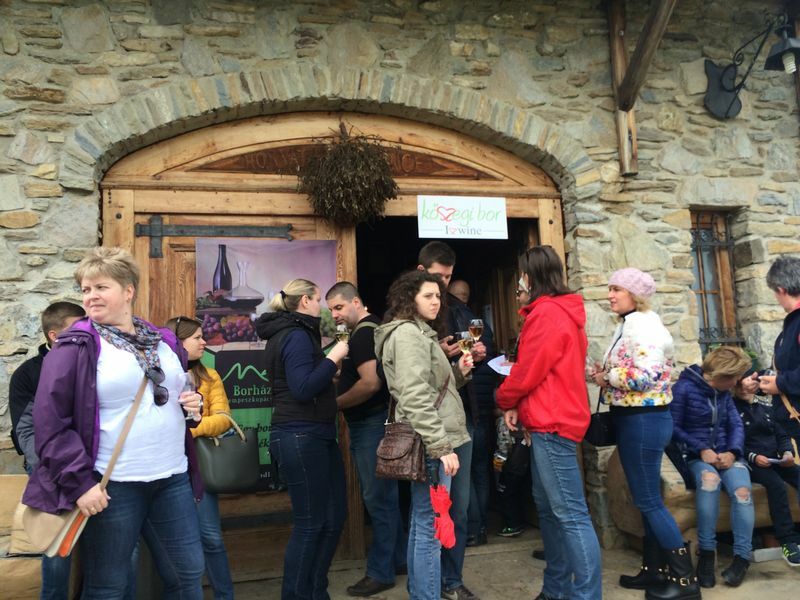 Grab your boots and wine glass, wander around the Pagan-valley and taste our wines! You can apply for the event until 12 May. After each registration a confirmation letter will be sent with a virtual ticket until 12 May. This ticket should be printed in advance and will be exchanged for a ticket with discount at the cash-desks. Price of tickets on the spot is 2500 HUF, but with former online registration it is 2000 HUF. We would like to inform you that the members of press may produce image and video recordings of the event. Accordingly, all visitors by virtue of their participation give permission to the recording and publication of their image. We, organizers also make photos at the event, which later may be published on our social media sites (www.facebook.com/koszegiborokhaza) or may be used in other press releases. All guests are entitled to withdraw the publication of disobliging images by filing a complaint to László Kampits to info@koszegibor.hu.